A Book Baby Shower Theme - Full of Baby Brain Boosting Fun! 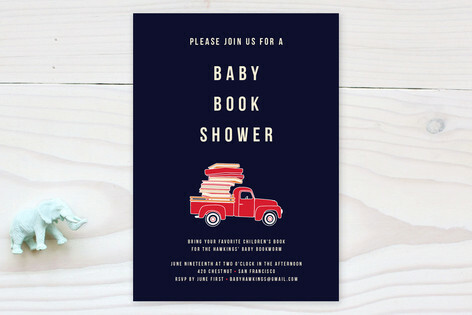 A Book Baby Shower Theme is great for getting supplies for your brainy baby. Put those bottle cap glasses away! It is no longer geeky to be a genius! Create a fun and inspirational baby shower that puts learning first. Create a bookmark invitation to announce the party to your guests. Use a hole punch to add a hole to the top. Thread some pretty ribbon or yarn to the top. Something to bookmark! It's a book baby shower for (mom's name) on (date) at (time). 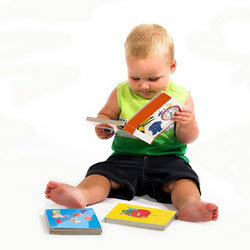 Please bring a favorite baby or child's book instead of a card to help start a great library for the new baby! Create a memory book for the baby- You can do a specific page for each person. 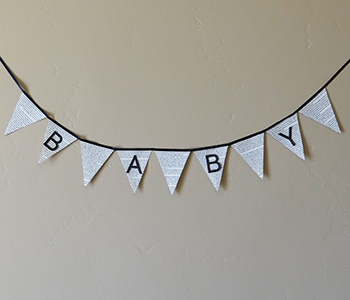 Use a newspaper from the date of the baby shower to create the background for the memory book. That way, the baby will be able to see the important people, and news, of the baby shower day. Take a binder and cover it with batting and material of choice. Insert a spot for the picture by cutting a frame out of cardboard and covering with same or separate material. Prepare pens, markers, materials and embellishments beforehand so guests can take turns decorating the memory book. Delivery Room Statistics- Make a list of statistics for the guests to guess about the delivery day. Some ideas would be to guess baby's weight, height, length, and gender (if unknown). Board Game Fun- Old fashioned board games can get the brain waves flowing! The game of life would be a fun one to play. You can give prizes for different accomplishments. Decorate Onesies: Print shapes of animals or objects from favorite childrens books. Applique them onto onesies with fabric or felt. Book Signing: Pick a favorite childrens book for guests to sign and write messages to the family in. Use apples, books and chalkboards as decorations on the food table. You could use small chalkboard labels to label the food items. Use phrases from favorite kids stories and nursery rhymes around the room. 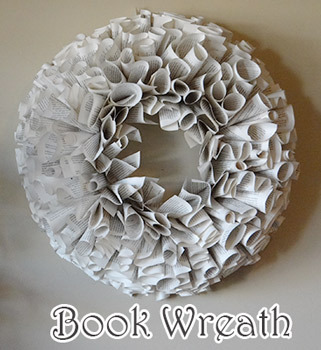 Get a Styrofoam wreath and book from the dollar store or thrift store. If the book is small, you might need 2 books. Start by creating an old look by rubbing brown and grey paint along the outside edges of the book. Tear the pages out of book along the seams. (This is why I say to go to the dollar or thrift store for your book. I didn't want to ruin a brand new book. It just feels wrong to do that!) Roll or fold pages with the painted edge facing out. I did a roll and a s shape fold. I was careful on the s shape not to crease the edges of the paper, just glue the bottom so it would have a nice curvy shape. Use hot glue to hold the bottom unfinished edge together. 1. Starting at the top of the wreath, attach one layer of pages along the outside edge. 2. Flip wreath over and place heavy object on it to hold pages in place for a few minutes. This will be your bottom layer. 3. Continue to layer pages in a circle with each circle on top of the last one. Notice how I am glueing the bottom of these layers up, like a tab. Use remaining pages to fill any empty spots you have in the wreath. If you have any uneven spots that stick out, you can trim it with scissors so it keeps the wreath shape. 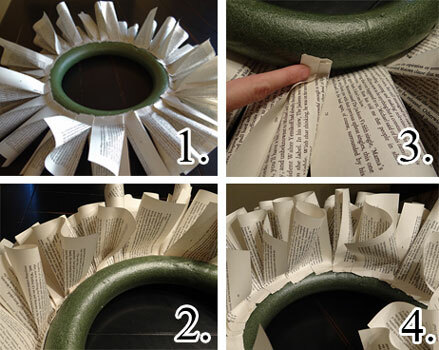 Book Pendant Banner: Create a pendant banner using leftover pages from your book wreath. The size on the triangle will depend on the size of your page. The size I used in the picture above was 4 inches on the width and 5 inches on the height. Print letters in your word or editing program, cut out and attach to banner. Create mini book garland using cardstock and printed words on paper. Fold to create book and attach to string, ribbon or fishing line. Hang garland across the room or dangle from tissue pom poms to create the look of rain. Collect and make copies of pictures of the mom and dad as children. Hang on clothesline or yarn with clothespins. Set up train set to wind along the food or gift table. If you do not have one... craft stores carry pre-finished wood train cars at inexpensive prices. Attach a banner to it that says reading railroad. little poem books, notepads, pens, paper, and gift cards to a local book store ($5 or $10).